There’s a very special kind of scooter nut enthusiast to add a sidecar to their bike. Previously, only vintage or new-vintage, metal body scooters like classic Vespas or Genuine Stellas have been able to support the extra load and complexity of a sidecar rig. I enjoy how scooters mean so many things to so many people. More often than not, a scooter seems to mean a sort of anti-rebellion — almost like giving the finger to someone who is giving you the finger. 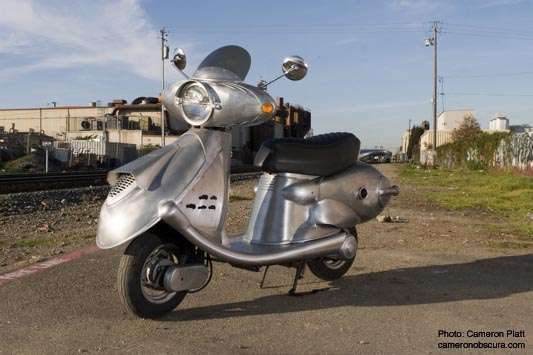 Customizers love to take scooters and make them into ironic versions of established motor tropes. Not too many scooters come off as mean and menacing. This is especially true for the larger, maxi-scooter category. So what happens when venerable bike designer Roland Sands gets his hands on an unsuspecting Yamaha TMax? Something amazing. I’m not even certain what scooter this was when it started, but now it’s a lean, mean, award-winning machine. 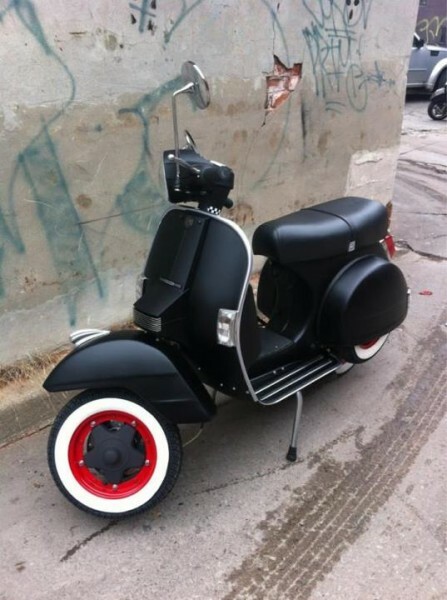 This flat black beauty is the work of Toronto’s Motoretta scooter shop. I’ve got $5 says there’s some pomade in the glove box.